One of Netent’s better games, the bonus rounds are fairly interesting, the money you can win is big and the graphics are sharp. There is just something about shiny jewel type objects shimmering into starburst pay outs that this VegasMistress likes! Starburst opens with an inquisitive melody that builds your anticipation. You are shown sparkling diamonds in yellow, blue, red and purple. There is the blessed autoplay button and, in a show of Netent's true style, there are easily accessible buttons at the bottom of the game-screen to change the settings and get help. The spins are smooth and highlighted by a sleek sound with no unnecessary bells and whistles. The glimmering graphics appear sharp and inviting. With each win, the slot symbols light up adding to the excitement of the game. The colourful reels paired with shimmering lights make the graphics look very impressive during gameplay. 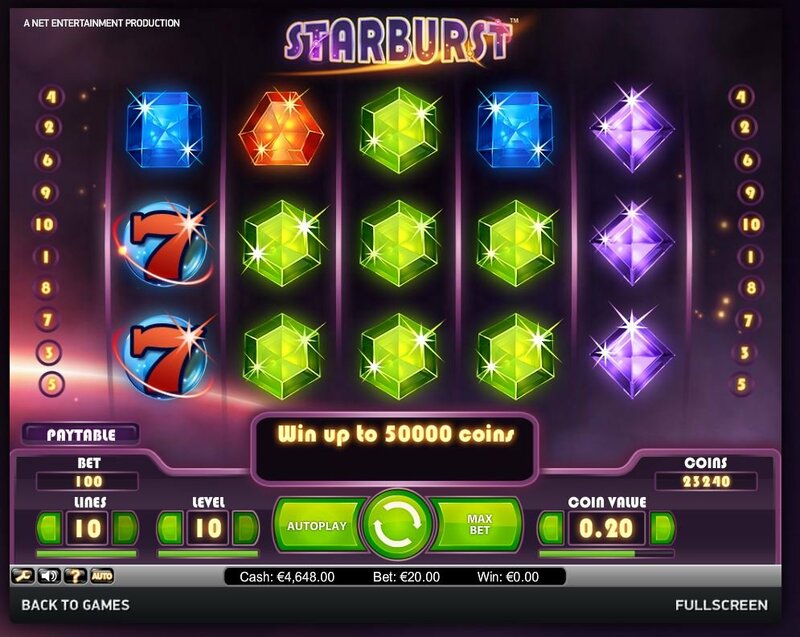 There is a simple elegance at play and, the less is more approach with the symbols is easy on the eyes, and lets you concentrate on spinning your way to a Starburst Slot bonus. After a few spins, the music does begin to weigh heavily and, I utilised the conveniently placed button at the bottom to mute it. This brings me to a nifty feature - using the readily available settings, it is possible to choose to use your keyboard spacebar to spin, which is a dream come true for my wrists repetitive strain injury. 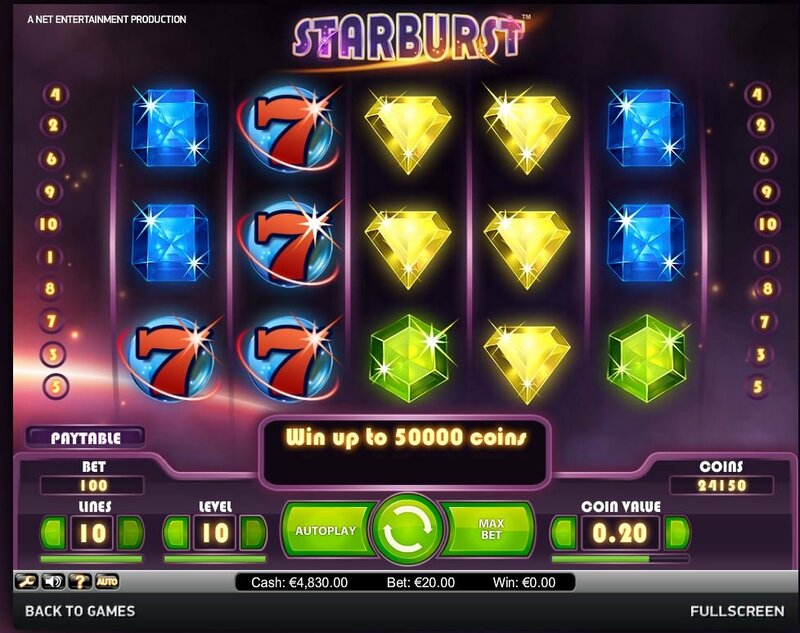 For those who want to get on with seeing the cash roll in, there is a small settings button for the Starburst auto play feature that lets you decide between 10, 25, 50 and 75 spins in a roll. The glimmering graphics appear sharp and inviting. With each win, the slot symbols light up adding to the excitement of the game. 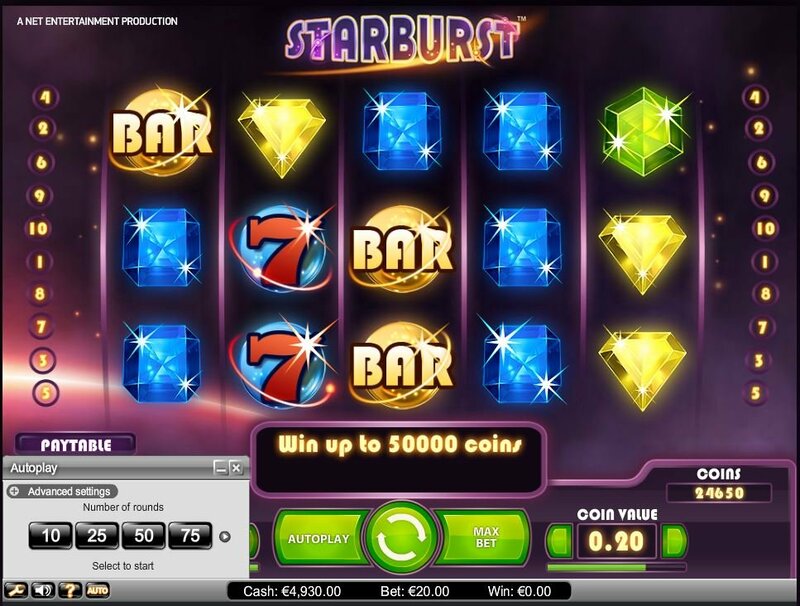 As the name suggests, the Starburst Slot game comes bursting with bonuses. Altogether the game contains 10 paylines. Despite the small number of paylines, players have the chance to win up to 50,000 coins in the highest payout. Wild Symbols in the game substitute for every symbol. Land on these and the Wilds expand across the reel AND trigger a re-spin bonus up to 5 times. There are super combo's galore and opportunity to really burst your stars into colourful money making machines. There are plenty of thrilling colour combos and, once you get a starburst, it sticks around so you can match it with more gleaming gems of any colour. You automatically get a free spin after a starburst bonus.